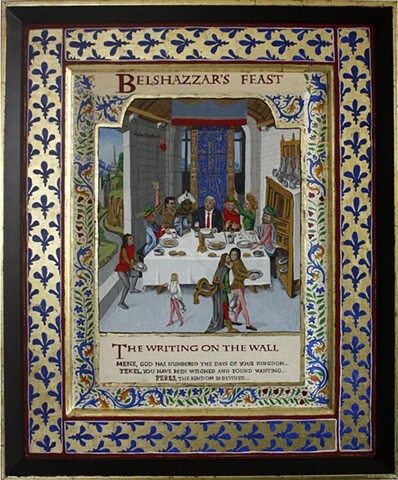 After - Bible historiale: Tobit to Acts Belshazzar's Feast. Tobit is one of 12-15 books generally recognized as comprising the Apocrypha. At the table with the President is, from the left, VP Pence, Donald Jr., Tim Scott, Trump, Sessions, Trey Gowdy, Lindsey Graham. Friends suggested that the serving figure on the left looked like Nikki Haley. Above the diners the disembodied hand inscribes the warning on the wall. (pg. 206 Royal Manuscripts The Genius of Illumination).